TADHack has grown yet again, with currently 3300 registrations, quite a few locations had close to 300, and of course TADHack Sri Lanka leads the pack On the first TADHack global weekend there were close to 100 hacks created from around the world. The locations running on 23 – 24 September were: Auckland, Brisbane, Melbourne, Sydney, Islamabad its satellite Karachi, Kuala Lumpur, Kyiv, The Hague, Lagos, St Petersburg, Chicago, and Buenos Aires. 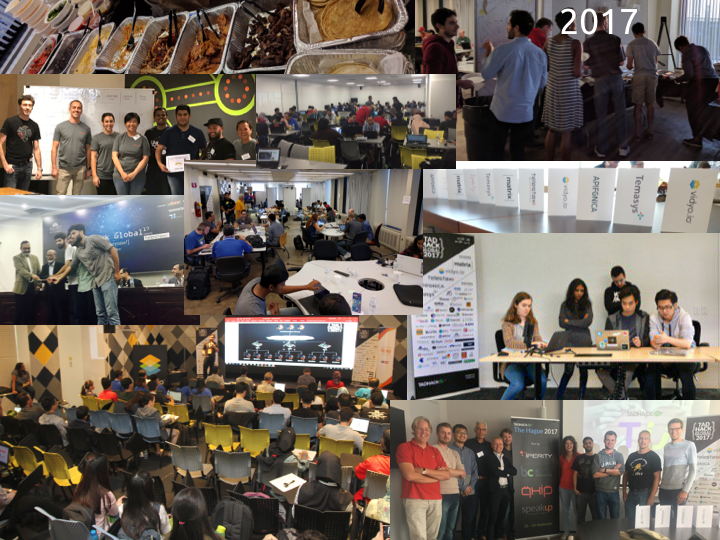 We do not have space to list out all the hacks created, we’ll link to weblog that do deeper dives into individual locations, like TADHack Chicago. To everyone who took part, especially those who did not win this time. Being a TADHack winner is just someone’s opinion. Its the market that decides if your idea is great. If you believe in your idea, make it happen and let the market decide. Ruwan from Extrogene (one of the keynotes this year) was a runner up, but he made his idea a commercial success. Please learn from TADHack, and come back next year to hopefully win. As a small business owner, I spend most of my time loosing / failing (not winning deals), but every now and then I win. Persistence pays in my experience. Now onto the TADHack Global weekend 1 review. Weekend 2 is currently happening, and we’ll review the results of that next week. Brisbane: PMedic (click on the link to see the pitch video) used Apifonica, Telstra T-Dev, Parrot, iHeath by Salvador, Kevin, Avon, Juan, Reuben, Yutthana. Their aim is to help people living with epilepsy to regain independence and safety by using wearable and connected technologies. Won the local creativity prize. Brisbane: Coffee Hackers used Matrix, Oracle Cloud Platform (Container Cloud, Application Cloud, Analytics Cloud) by Behnaz, Francois, Alexander. Intrusion detection system – when an attacker attempts a NoSQL-injection into the anki-medrec application our analysis* reports these incidents to a pre-configured Matrix room. Security analysts are alerted in real time (we use the Riot clients for web and mobile for our demo) and can take immediate action. Based on meta-data about the attack that we embed in the Matrix messages, we can visualize attacks using an Oracle Data Visualization cloud application, again in real time. All components for publishing and processing analysis reports were built using the Matrix Node.js SDK. Local honorable mention and Matrix global winners. Brisbane. EventMuster using Apifonica and Meetup by Dominic, Lucas, Riccardo, Saulo, Christopher, Khuslen, Keith. Event service for rural communities connecting people to different events in their location. Won the TADHack Location Prize. Brisbane. EqualityBot used API.AI by Jaimyn Mayer. A chatbot to answer questions about equality. Won the local creativity prize. Melbourne: EzyHealth used Matrix and Vidyo by Manindra, Lee Weng Kin, Gavin. Connect sick people in remote locations. Services: EzyDoctor (Locate Doctor), EzyChat (Connect with others), EzyLocator (Find Hospitals), Ezy Educator (not for profits to connect), Ezy Funds (Funding Crowdsourcing), EzyEducator (Medical Literature), Emergency Button.. Approx 6 services. Won a local participation prize. Melbourne. ComNect used Telestax, Matrix and Oracle by Nicola, William, Nicholas, Gerald. Reliable infrastructure to connect individuals from rural communities together by interest and location. Matching Algorithm in back-end. Web based application (Browser). Forum, calendar (local events), chat, etc. Won a local participation prize. Melbourne. Banana Exchange used Apifonica, Vidyo, Telstra and Oracle by Dipto, Raymond, Sirani, Vasu, Vincent. Ask your Doctor – Lightweight Telemedicine Solution. Focussed on regional patients. AI chatbot to filter patient back to relevant doctor. Won the TADHack location prize. Melbourne. Roya used Vidyo and Oracle by Sean, Alex, Sonya, Rongjun. Democratisation of experience despite any particular disability – colour blindness, loss of hearing, loss of sight.. Detect disability, detect proximity. BT sensor triggers proximity sensor to alert user of relevant content (running late for event – sends catch–up info when arrives). Video conf – adds colour if colour blind, adds subtitles for deafness, etc. Won the local creativity prize. Melbourne. Comrades used Matrix, Video, Telstra and Oracle by Sam, Yataro , Zhiqian, Josh. Connect ill children with mentors and those afflicted with similar conditions. Chat and video interactions. Governed by mentors. “Won the local challenge prize. Sydney: Bunyip using Vidyo, Telstra and Oracle resources by Jagdish, Joyce, Si, Meiling, Rahil. “Digital Story Telling connecting boundaries” Use Case : Child Suffering from leukemia, group sessions are recorded, sms link for, users sign up, story being recited, accessibility features covered, SMS Link to Judges, Special Kids Connect Volunteers.” Won the TADHack location prize. Sydney: S-Forum using Vidyo, by Sushant, Linda, Samuel, Martin, Shelley, Jack. Farmers Market: Lot of prep required for the set up, Farmers can register and signup, Forums for Farmers, Farmers revieve an SMS, Calendar System, Professional Help, NLP Program, BOT to respond with queries, Helping Website design. Won the local challenge prize. Sydney. ConnectRoo Used Apifonica and Telestax by Tobias. Data on Demand through Voice call or SMS, rural with little coverage, why? more service provided online, 4G coverage only in big cities, done some research on the Why they need this product, No website no device, First generation phone, Ask anything, No internet, APIFonica, Telestax – Voice Call, speech to text, Oracle Cloud (DBCS), Worked out the Costs, Freemium model, Deployment Model and roadmap. Won a local participation prize. Won a local participation prize. Sydney. C-Three used Matrix by Amar and Dhanest. Connect health records to services, Mobile App showing Health Records, Conversational Mobile, AI, Voice Authentication, MATRIX – Video / File Shaing Platform, Telstra APIs, API.AI, Offline Synch, Only Talking about products so far, Conversation Interface to update Health Records, API SDK’s. Won a local participation prize. Won a local participation prize. Auckland. Mediconnect using Temasys and Oracle by Sophia, May, Momataj, Quang Minh Dinh, Tien Nguyen Khac, Ricardo. Connecting Mobile phones via video to medical contact center. Won a local leadership award and Temasys global winner. SafePlace used Vidyo, Telestax, Apifonica, Dif-cam-engine for the motion detection by Martin, Bruno, Guillermo. Security system that detects motion using the camera and let know via sms and voice when there is some suspect movements. Won TADHack location prize and Vidyo global winner. Foody used Apifonica, Matrix and Telestax by Bruno, Gianluca, Gian Marco, Gabriel. Web and mobile application that helps on the food delivery. Won TADHack location prize. Fluency used Vidyo by Nicolas, Carolina, Juan Carlos, Elio. System allows to correct the audio produced by a stuttering person in real time. Won TADHack location prize. QrCall by Pedro, Rafael from TADHack Buenos Aires. System that allow to contact professionals without sharing private data such as phone numbers or email. It uses a personal card with a QR code that being scanned it triggers a WebRTC Call. Vidyo global winner. Chicago run by IIT RTC Labs, Telnyx, Phaxio, you can read more about all the hacks here. Project Sapphire Network used Telnyx by Pratik, Lucas Zhang, and Yani. It allow small businesses to manage inbound/outbound numbers through a mobile application without spending money on additional telephony hardware like VoIP phones. They won Telnyx location prize. One aspect that impressed the judges is they did market research of local businesses during the hackathon, and are hungry to make this a real service. AICollab used Telnyx, Phaxio, vidyo by Abhishek Bhardwaj. Its a deep learning Github for Doctors. He won the Telnyx and Location (IIT RTC Labs) prizes and Vidyo global winner. Helpr used Apifonica by Dan Morgan. Its a supplemental application for a RedCross-like organization that uses a NLP (Natural Language Processing) processor to prioritize help and optimize rescue using SMS. Apifonica global winner. Moomble used Telestax by Hamza Zakir. Real time SMS converter to the language of your choice using Google and SMS APIs. Considering the significance of language barrier this solution converts SMS into the any desired language and send it to the recipient in his local language. It does not require a smart phone on both end as all the conversion and sending and receiving is done at server side. Won TADHack location prize. Sahoolat used Telestax by Osama Arshad Dar, Shazab Naveed, Haider Ali. IVR based solution for the home maintenance. Using the Telestax IVR system a user can select plumber, Mechanic, Electretion etc near his vacinity. Also he can pick up a low cost handyman of his own choice. Won TADHack location prize. Save Me used APifonica, Temasys by Orest, Nikita, Dmitry, Oleksii. “Save Me” will find somebody near you to help. Won TADHack location prize. WebStreamer used Vidyo by Ivan, Evgenii, Dima. Web platform that allows users to stream their videos simurtaneously to youtube, facebook, periscope and ect. Won TADHack location prize. Foodger used Apifonica by Aleksandr, Maksim, Anton. IoT device that control a quantity of products in a kitchen and push notifications if a this quantity is critical. Won TADHack location prize. Envmon used Temasys by James Ong. Desktop office environment monitor based on Arduino, RPI based hub that collects data. Won the MDEC IoT prize, and Temasys global winner. BEAMS used Apifonica, Digi Identity, Digi Payments, by Daren, Sean, Gerald, Low Wei Leong, Cheong Pei Bin. Chatbot based marketing and engagement tools. Won TADHack location prize. Meet the Doctor used Temasys, Vidyo, Digi Identity, Digi Payments by Hafizuddin, Budie, Syahiran, Hasif, Syukri. Remote heath application for finding a doctor and sharing information with a doctor. Won Digi prize. PROHIPSON used Temasys by Nabilla, Hamzah, Thiventiran. An airbag for the Hip. Won the TADHack location prize and MDEC IOT prize. Voice Suicide used Apifonica, Digi SMS by Leong Yok Tien, Lee Soon Yan. Voice analysis for hints of depression and suicide. Won TADHack location prize. Power Snap used Digi APIs, Google API by KB Lee. Purchase products by taking a photo and have the products automatically identified and available products for purchase displayed. Won Digi prize. Chloring used Apifonica and Matrix by Low Ming Xiu, Boon Shi Ting, Chew Kam Fatt, Khoo Hung Siang, Chin Shin Yi. Sensor for detecting falls in the elderly and alerting family members. Won MDEC IoT prize and Apifonica global winner. Texto (Team 39) by Lim Kok Sang, Choo Hong Yee, Lim Sze Huang, Low Bee San from TADHack KL. Video conferencing with a recorded transcript. Vidyo global winner. Veripro used Apifonica, Telestax by Abd-afeez, Damilola, George. Fake consumeable products are rampant in african market and it had been a huge source of worrry as, various cases of death or injuries have been recorded from consuming such products. Veripro as a product focuses on solving the health challenges poised by these adulterated products by creating a simple tool that simplifies product authenticity check by consumers and yet creates a production track by the regulatory body of a country. The product exploits ussd as a gateway for the users hence ensuring more reach and avoiding internet concerns in this part of the world. Won TADHack location prize. Med911 used Video by Babatunde, Dunsin. Our solution is a mobile app (Telemedic & USSD using vidyo.io and local Local telecom API) that allows junior health staff in rural clinic to make live video call to experienced specialist or senior doctors to seek assitance expecially in case of emergency. It also allows people in rural area book a request via USSD from their mobile phone to visiting doctors without the need of an internet connection. Won TADHack location prize. CaRescue used Apifonica by Adedayo, Olukayode, Jonathan. CaRescue is a system developed to allow motorist in distress to connect to help or assistance nearest to their location, even in areas without data coverage. Won TADHack location prize. Roogle by Emmanuel. Roogle enables anyone with a phone of any type to make quick searches on Google via USSD. Won local USSD prize. Rombo used Apifonica by Pavel, Vlad. Safe Riders: Safe taxi drivers service. An app for violation of driving rules detection. Won TADHack location prize. Post-Modern Students used Telestax by Roman, Svyatoslav, Yaroslav, Mikhail. Live Coding — tool for couple programming and learning. Won TADHack location prize. Under the Bridge used Matrix by Stanislav, Andrey, Vadim, Ilya. Red Need: app to search friends for leisure time. Won TADHack location prize. * by Igor Kirichenko Dmitry Volkov from TADHack St Petersburg. PKI component in Matrix identity via Keybase. Matrix Global winner. Amazon Connect, Amazon Alexa, Google Speech Recognition API by Mihhail, Ming Li, Idan Esher, Voltaire, Tijs, Timo and the support of many others. Helps elderly people by engaging youngster as to strengthen local communities. They won the TADHack Location prize, and Matrix Global winner.